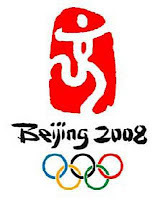 Dancing Beijing is the Chinese chop or seal chosen as the emblem to represent China's long journey to the 2008 Olympic Games. It is said that Dancing Beijing represents "the heart of an ancient culture embracing the modern world and the spirit of a people moving toward a new destiny." From my more than three week perspective living and working here - I could not agree more and this emblematic tribute perfectly befits this fascinating, much misunderstood nation. Quite honestly, my overseas colleagues and fellow long-time Olympic collaborators and I dreaded for months having to come here. And most all of us - if not all of us, over the days, weeks and months now spent here, have had our eyes and our minds heaved wide open to this fantastic place called Zhong Guo; the nation that has so quickly captured our hearts and so easily forgiven us our doubts. We are both delighted and humbled by our experience, so far, and we ponder how we might have been so wrong. I am not here to discuss or excuse the controversial aspects of this nation; I have no doubt to the validity of those concerns. But I can tell you this without hesitation: the foreign media's disservice to China is absolutely unfathomable; Beijing is a vibrant, fascinating city that celebrates both its ancient heritage and its modern awakening; and every single person I have met here has embraced me with a kindness and courtesy that is unmatched in my previous travels anywhere else in this world. I can also tell you that there are two sides to every story and you just get to hear one. As the Opening Ceremony of the 2008 Olympic Games begins tonight, you have a chance to glimpse another side. The people I've met, from co-workers and taxi cab drivers and everyone else in between, in no way deserve the disdain the world is so quick to exact. So tonight, come dance with Beijing -- take a moment to watch the first part of the Opening Ceremony that so stunningly conveys the fluid, graceful, and oft hidden beauty that is the people and the place called Zhong Guo - and celebrate with them as this nation rises up from the middle kingdom bearing a torch to light the world. In the spirit of Dancing Beijing I leave you with the dragon ladies of Beihai Park, who, like the Dancing Beijing emblem, embody the boundless spirit of this nation with their sinuous silky curves cutting fluid arcs of dragon tails in the early morning hours of this mesmerizing city. These pictures are beautiful. I love watching someone dance with silk, how easily they capture my attention. I'm pleased to hear your travels are going better than expected. Its always nice to enjoy a trip previously dreaded. Hope you continue to enjoy your travels/ Olympics. Have a nice day. WOW. Great thoughts as well as photos. You realize, Tim, that your every growing blog readers are experiencing China vicariously through YOU (not too much pressure on you, ha ha)! So thank you for the alternative view and keep it coming! Well spoken! And so true. Having been around the block and having set foot on 4 continents, lived on three, I can only say that we as humans are pretty much the same wherever you are. The same daily worries and woes, the same fun and joys. Keep making a difference by showing us the real China and it's people. Beautiful pictures and well-done commentary. People are people. Governments are made of people, but the people of China definitely not the government of China. I have never been there, but a branch of my family lives there most of the year and bring back lots of different people for visits each year when they return. I never met kinder people. Never. How splendid to be there now! I've just found your blog and am really enjoying what you have to say about China and the perception of others outside the country. The opening ceremonies were magnificent! I love Chinese silk dancing--thanks for the lovely photos & for reporting a clearer reality of the Chinese situation. It seems these days that too many people are too quick to accept what the TV tells them &/or jump to conclusions. The photos were beautiful, and the words inspiring. China has never been high on my list of places I'd like to visit. Thanks to you, I'm re-evaluating that position. I did watch the opening ceremonies and I'm glad I did. I was in awe. I could see that despite whatever problem exist, they are a country steeped with beauty, culture and artistry. I was totally wowed! Hey, T.R.! You're absolutely right. It's not the people, the citizens of the country that we should fear, it's their government. Kinda like the U.S.! It's our leaders that the world sees, and not us. Our administration has made us the most hated country in the world but not because of its citizens. I'm glad you showed us that insight into the real Chinese people. What you reveal is what we see here, Tim. All beauty in the faces in China and their country during a historical event I can't ignore. I'm glued to it.